Angela K. Wibben, MM, MT-BC, has been a board certified music therapist within adult and pediatric medical settings since 2013. She has been an integral member of hospital interdisciplinary teams for pediatric and adult oncology, NICU, PICU, ICU, pediatric pain management, and general medical-surgical units. Angela has additional professional training and experience in Neurologic Music Therapy, NICU and Medical Music Therapy practices and protocols, as well as drum circle facilitation. She is a Bachelor of Arts prepared percussionist from the University of Arizona and completed her Master of Music, in Music Therapy, from Colorado State University in 2012. Beverly and Skip Tinnell are RN’s working with Trauma and Stroke programs throughout Colorado. They also love to share their music with others through two local bands called Duo’ver and Circling the Drain. Soul’s Palette is thankful to have them playing music for patients in the Bone Marrow Transplant Unit. As a music volunteer at Presbyterian St. Luke’s Hospital and also a recent music therapy graduate, I am always searching the internet for articles and videos about using music in healthcare settings. This week in particular, several articles have literally fallen into my lap. This week, several newspapers published articles raving about the benefits of patients utilizing music during their hospital stay. They brought music therapy into the spotlight once again, but also offer very practical ideas for patients who might be looking for ways to decrease pain, emotionally cope with difficult diagnoses, or reflect on their own lives. Below I’ve included links for full versions of these articles and some older articles as well as excerpts from the articles themselves. For pediatric and adult patients, the bottom line is: engaging with live or recorded music, especially one’s favorite music, can have many benefits, including decreasing anxiety and pain levels while fostering relaxation and other physiological benefits. Music can serve as a powerful coping mechanism as well. MONDAY, May 20 (HealthDay News) — Music can help soothe the fear and anxiety of critically ill patients who have been placed on ventilators, reducing both their stress and their need for sedatives, according to a new study. Intensive care unit (ICU) patients allowed to listen to music of their choice whenever they liked enjoyed a 36 percent reduction in their anxiety levels compared to patients not offered music, researchers found. The ICU patients who were provided music also needed less sedation, with their sedative intake dropping 38 percent compared to other patients, the findings showed. The bluesy bedside jam session started when Jacob Switzer, 13, took his guitar into his dying father’s bedroom and joined two music therapists who were there to help ease his pain. Sunlight trickled in through the shut blinds in the dim bedroom as Steve Switzer, 53, groaned and asked his wife for more pain medication. He had liver cancer. A few days before, he enrolled in Seasons Hospice because there was nothing more the doctors could do. He had days left to live. Andrea Scheve, a 32 year-old music therapist, sat on the floor, strummed her guitar and improvised the “Stomach Ache Blues” to help distract him from the pain. Jacob sat on the foot of the bed. Inspired by the blues, Steve lifted his oxygen tube from his nose and off his face. He disconnected himself from the morphine pump and climbed out of bed. “What are you doing?” his wife Jennifer Switzer, 46, asked. She was startled, shocked. He hadn’t been out of bed in days. Steve returned with a bag of harmonicas. In the final days of his life, Christopher Weber sat up in his hospital bed and danced to Lil Wayne. A teenager who wore saggy pants and loved rap, Weber never let his cystic fibrosis define him. But it did inspire him. And not in the way he expected. This boy — who was hard-core hip hop — became a country composer. Through the music therapy program at Monroe Carell Jr. Children’s Hospital at Vanderbilt, Weber learned to play guitar and tell stories with the strum of his strings. He wrote songs that helped him with personal expression. He wrote songs that helped him cope. He was fighting the odds against his cystic fibrosis. Music made him forget that for a moment. Today, I shared music with 2 pediatric patients and their families. On a “usual” day on the pediatrics unit, patients eat, sleep, take medications, eat, sleep, and repeat. But on these days, they are also cared for by their doctors and nurses, visited by child-life specialists, and engage in activities with other Healing Arts volunteers. These are the “not so usual” moments in which pediatric patients get to develop in their social interactions, express emotions, and maybe even get a little exercise (improving upon their physical development). 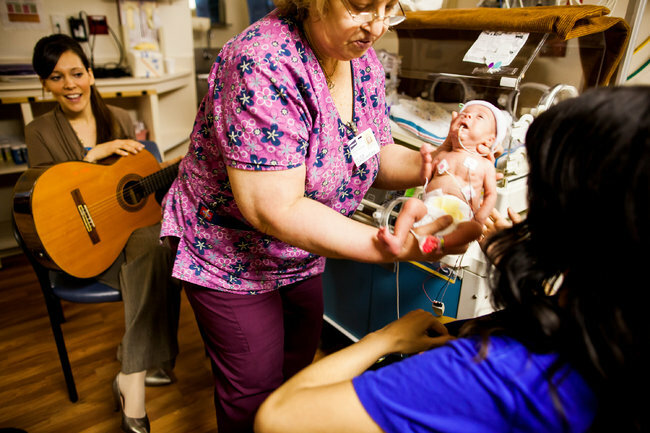 Music experiences can be used to help pediatric patients develop socially, emotionally, and physically, among other areas. Too often, the circumstances which keep a child bed-bound may also keep a child from developing like their typical peers. As a music therapy student, I have learned techniques and interventions to help children work on their developmental needs. Today, the patients I visited sang along, shook maracas, and played a mean tambourine beat. In doing so, one patient went from lying down in his bed at the start of our visit to sitting upright, smiling, and exercising his upper body while playing maracas along with me. After listening to the lyrics of a reflective song, that same patient also expressed his thankfulness for his family and the support they’ve given him throughout his illness. Another patient giggled and smiled at her father as they played together with me to Katy Perry’s “Firework”. Her dad had never heard of the song (or Katy Perry, for that matter! ), but he joined right in, willing to engage in social and healthy interactions with his daughter while passing time at the hospital. As a music volunteer for the Healing Arts Program, I’ve had other powerful moments like these in which I’ve shared music with pediatric patients, Bone Marrow Transplant patients, and oncology patients. I look forward to sharing more stories with you about how music can be used as a powerful tool to meet physical, social, emotional, and spiritual needs of hospital patients.